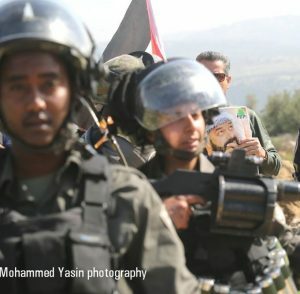 Dozens of Palestinian, Israeli and international peace activists held, Friday, the weekly nonviolent procession against the illegal Israeli Annexation Wall and Colonies, in Bil’in village, west of Ramallah, and demanding the release of all symbols of peaceful resistance in occupied Palestine. 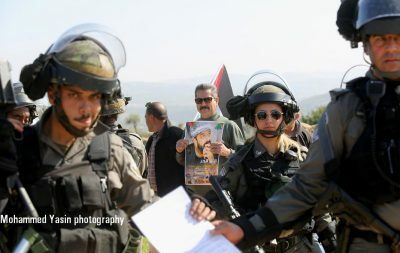 The protesters carried Palestinian flags, and posters of figures of nonviolent, popular resistance in occupied Palestine, including ‘Ahed Tamimi, Nariman Tamimi and Monther ‘Amira, the Popular Committee against the Annexation Wall and Colonies said. 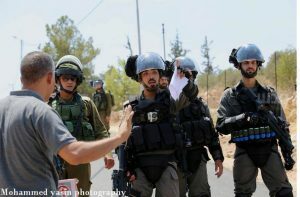 The committee added that the soldiers ambushed the nonviolent protesters in the ath-Thaher area, west of Bil’in, and tried to prevent them from marching, but the protesters continued towards the iron gate of the Annexation Wall, near Abu Lemon area. 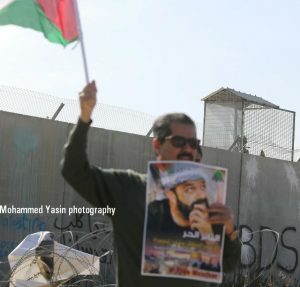 Many protesters then started knocking on the gate with stones, and others wrote graffiti and chanted against the ongoing Israeli occupation of Palestine. Dr. Rateb Abu Rahma, the media coordinator of the Popular Committee in Bil’in, denounced the Israeli escalation, and the ongoing imprisonment of Ahed Tamimi, and her mother Nariman, in addition to Monther ‘Amira and various figures of the nonviolent struggle in Palestine. He added that the Palestinians will never abandon their rights, their struggle for independence, the release of all political prisoners, and the liberation of Palestine, including its capital, Jerusalem, despite the illegal Israeli policies, and the illegal stances of the U.S. Administration of Donald Trump, recognizing Jerusalem as the unified capital of Israel, in direct violation of International Law and all related United Nations and Security Council resolutions. In related news, the soldiers injured at least twenty Palestinians in the al-‘Isawiya village, in occupied East Jerusalem.